Believe it or not, this is a Buddhist bodhisattva (saint). My very first posting for this blog was about the Greek invasion of northern India and how it affected some of the earliest images of the Buddha. I just thought I’d revisit the topic because it’s a fascinating example of how this world truly is a global village. Did you ever join hands with three or four friends around a really old, big tree? That’s sort of how I look at these artistic connections! The early Indus Valley civilizations produced mostly small-scale sculpture of steatite and limestone. The most notable sculpture of the Mauryan period (320–185 BCE) was edict pillars erected during the reign of its greatest leader Ashoka (304–232 BCE). Many monastic communities were hewn out of rock and adorned with sculpture. The earliest stupas from the first 200 years BCE had important carved gateways and surrounding fences, and included some larger-scale figures of the Buddha. In southern India, religious complexes were decorated with complicated bas-relief programs. After the collapse of the Mauryan dynasty (ca. 185 BCE), India broke into several local power centers, each vying for supremacy and troubled by harassment by northern peoples. One of these, the Kushan, had left the western borders of China (called Yuezhi by the Chinese). The Kushan entered India through Afghanistan in the first one hundred years BCE. They had already displaced the Persians in the lands once conquered (332 BCE) by Alexander the Great (died 323 BCE). After establishing a dynasty in India, the Kushans established trade with Roman colonies. 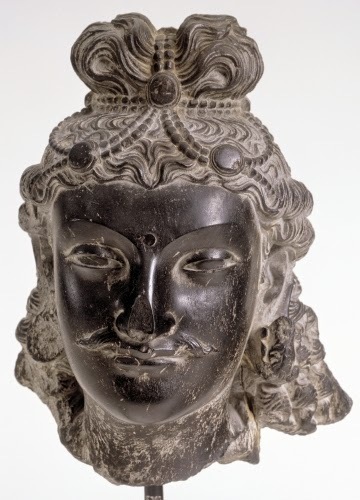 Two significant styles developed between the 100s and 400s CE, the art of Gandhara (now Pakistan), and the art of Mathura (far to the south and east). It was during the Kushan period when the first sculpted images of the Buddha were produced. Because there were no Buddhist figural images before contact with Western cultures, Roman and Hellenistic forms gave shape to sculptures of bodhisattvas and the Buddha. 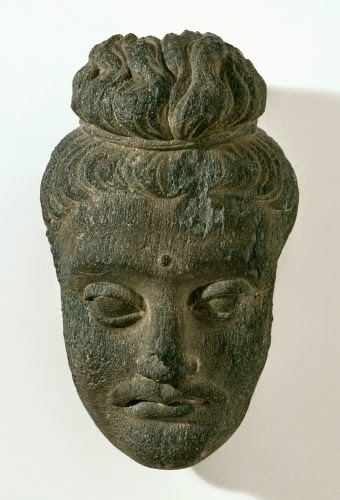 The Gandhara-type Buddha typically has an oval face, arching high brow, and broad nose. The wavy hair, tied in a ribbon, was a Greek style seen, for example, in the Vatican's "Apollo Belvedere." This fashion detail gradually became the symbolic top knot (ushnisha) on the Buddha's head, which was a symbol of his wisdom. The moustache is an Indian characteristic, as is the caste mark on the forehead. 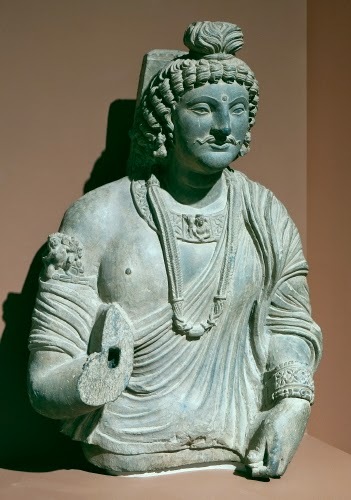 Gandhara Buddhist figures had a profound influence on subsequent images of the Buddha. Ironically, in the 500s CE, in the region where the sculpted image of the Buddha was born, an invasion by Huns stamped out Buddhism forever.